MAXIMUM OCCUPANCY. Every property is rented with a maximum allowed occupancy. There shall not be more than the amount of adults and children as per your reservation. Children aged 5 and under are not counted in the occupancy limit. All guests over the limit will be assessed a $5 per person per night fee where mobile homes, campers and sleeping bags are allowed and must be pre-approved by Idaho Vacation Cabins, LLC. Any usage by any large group gathering, including parties, weddings, reunions, etc. will incur additional charges and must be approved by Idaho Vacation Cabins, LLC, prior to guest arrival. Exceeding maximum occupancy without prior authorization is grounds for immediate eviction and forfeiture of all funds paid. Once final payment has been taken, NO refunds will be given for lower occupancy. SMOKING. Smoking is NOT allowed inside any property. Disposal containers are provided outside for guest use. Guest is responsible for disposing of butts properly. $50 will be charged to the card on file if extra time is necessary to pick up after guest. PETS (DOGS ONLY). Pets are permitted in “pet-friendly” properties only, must be pre-approved, and the Pet Addendum must be completed. Intentional disregard of pet policy will result in immediate eviction and forfeiture of all funds paid. RESERVATIONS. You must be 21 years old to make a reservation. All guests under 21 must be accompanied by a parent or legal guardian unless prior approval has been received from Idaho Vacation Cabins, LLC. The balance due on all bookings will be taken 30 days prior to arrival. CANCELLATIONS. All cancellations will be charged a $50 fee. Cancellations within 61 days of arrival will receive a full refund. Cancellations within 30 days of arrival will forfeit all funds paid. There are NO refunds for “NO-SHOW”. There are no refunds for early departure. You may choose to purchase travel insurance separately. See item number 18 of this contract. PROPERTY CHANGES. Due to unforeseen circumstances beyond the control of Idaho Vacation Cabins, LLC, the specific property booked may become unavailable. Every effort will be made to find provide a property of equal or greater value for the same time frame. There will be a $75 charge for a voluntary cabin change. Changes can only be made 30 days or more prior to arrival. If you need to change cabins due to an increase in the number of occupants, another cabin, if available, may be substituted with the appropriate cost adjustment. Idaho Vacation Cabins, LLC’s liability will be limited to the refund of any funds paid. NO DAILY MAID SERVICE. Linens and towels are included in the cabin, daily maid service is not included. Guests are required to bring their own beach towels. We do not permit towels or linens to be taken from the cabins. Each property is cleaned prior to your arrival. If the premises appear dirty or damaged upon Check-in, Guest shall inform Idaho Vacation Cabins, LLC immediately. Excessive cleaning after your departure will be charged to the credit card on file at $25 per hour with a one-hour minimum. Excessive cleaning is considered anything beyond changing bed linens, dusting, vacuuming, mopping, cleaning bathrooms and kitchen and putting away clean dishes. PHONES. Phones provide local (Garden Valley) calling only. Long distance charges must be put on Guest’s calling card. Any calls billed directly to the property will be charged to the Guest’s credit card plus a $15 service charge. WATER AND SEPTIC. All properties are on wells and septic systems. The mineral content in the water is very high. The water may have an odor. It is safe to drink, however, please bring bottled water for drinking if you are sensitive. The septic systems are very effective; however, if improper material is flushed, they will clog up. DO NOT FLUSH anything other than toilet paper. NO FEMININE PRODUCTS SHOULD BE FLUSHED AT ANY TIME. If it is found that feminine products have been flushed and clog any part of the system, including the toilet, you may be responsible for damages up to $500. POWER/SATELLITE/INTERNET, ETC. There may be times when a utility service such as power, phone, satellite, or internet has a problem outside of our control. Also note not all cell phone carriers have good reception in all areas of Garden Valley. If there is a problem with any service, we will do our best to repair as quickly as possible, however, non-usability of said service, or appliances, does not constitute failure on the part of Idaho Vacation Cabins, LLC and no refund or compensation will be made if the service cannot be made available. STORMS/INCLEMENT WEATHER. No refunds will be given for storms, snow, wind or any other acts of nature (such as wild fires during the summer months). Mountain roads and highways are well maintained. Subdivision roads are maintained but remain ice/snow covered. YOU MUST HAVE 4-WHEEL, ALL-WHEEL DRIVE AND/OR CARRY CHAINS DURING THE WINTER MONTHS. CHILDREN/RISKS/SAFETY. Children are welcome, however, there may be conditions in and around the property that may pose a hazard to them, as well as adults. Children must be supervised at all times. Guests shall hold Idaho Vacation Cabins, its employees or agents, and property owners harmless from any claims, causes of action or other liability for accidents, injuries or illness to Guest of invitees of Guest that are caused directly or indirectly from rental of said property. By accepting reservations, it is agreed that all Guests are expressly assuming the risk of any harm arising or loss or damages to personal property from their use of the property. LOST/NON-RETURNED KEYS. All keys must be returned to the drop box. Guest is responsible for lost keys and will be charged for re-keying the property. TRAVEL INSURANCE. Because unforeseen and unexpected events can occur that may cause you to cancel, interrupt, or delay your trip, we recommend CSAs Vacation Rental Insurance Plan. This insurance helps protect your vacation investment. The plan is optional, but we strongly recommend it. Please contact Idaho Vacation Cabins, LLC to purchase and have insurance added to your reservation. CREDIT CARD/ADDITIONAL CHARGES. Guest is liable for any damage to property and acknowledges that damages, excessive cleaning, long distance phone charges, etc., will be charged to the credit card on file and agrees to accept these charges. Any damages found upon arrival or occurring during Guest’s stay will be reported immediately to the office at 208-462-3475. Guests will be responsible for any unreported damages or theft. TERMINATION/AGREEMENT. 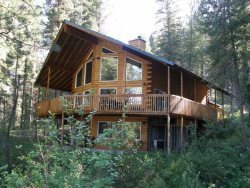 Idaho Vacation Cabins, LLC reserves the right to terminate the rental it, in its opinion, the Guest is detrimental to the property. Guest agrees to abide by terms of this agreement and by signing below is authorizing any charges remaining after departure to be charged to the credit card on file.